The Thomas & Mack Center continues to be San Diego State’s home away from home. 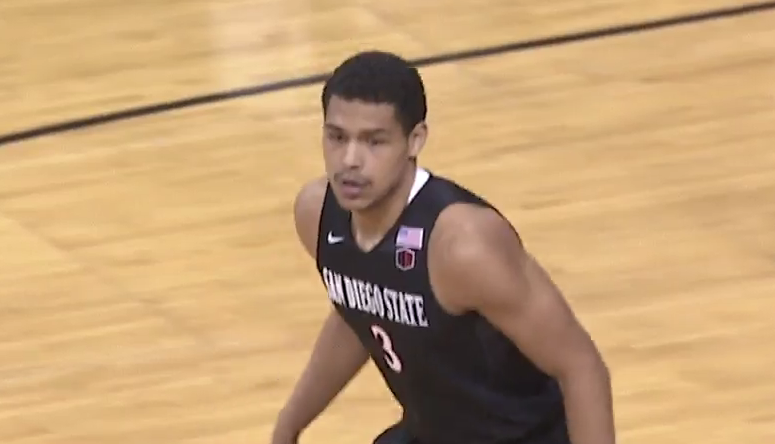 Junior guard Trey Kell scored 16 of his season-high 24 points in the second half and the Aztecs held UNLV to just 20 second half points in pulling away for a 64-51 Mountain West victory on Tuesday night before an announced crowd of 10,007. San Diego State (11-7, 3-3) extended its win streak to nine games over the Runnin’ Rebels (9-10, 2-4) including six in a row at the Thomas & Mack. The Aztecs also improved to 10-3 in the building since the 2013-14 season while head coach Steve Fisher picked up his 29th win in the T&M, second-most among active Division I coaches behind only former UNLV and current Oklahoma coach Lon Kruger (100). The Runnin’ Rebels, looking to build on a 71-66 victory at New Mexico last week, led for most of the first half but forward Max Hoetzel’s 3-pointer gave San Diego State a 34-31 halftime lead. The Rebels closed to within 38-37 on a Christian Jones basket with 17:06 remaining but San Diego State went on a 26-11 run over the next 16 minutes with Kell leading the way, scoring seven consecutive points during one stretch. WHO STOOD OUT: Kell had a game-high 24 points on 9-of-15 shooting and broke the game open when he scored all seven points during a 7-0 San Diego State run that put the Aztecs ahead 51-42 with 8:07 to go. The Rebels never got closer than seven points after that. QUOTES TO NOTE: “You don’t want to create demons bro. You don’t want to talk up demons. I love them. I think they’re good, and they’re resilient and they’re confident and they’ll be ready to go Saturday. I don’t think anybody is fragile. I think San Diego State is a better team and they beat us. That’s pretty much what happened. Come on man. Let’s call it what it is now. It’s San Diego State. A pretty good team, a top 25 team defensively in the United States, and they proved it. We scored 51 points.” – UNLV coach Marvin Menzies when asked if his team’s psyche might be fragile after Tuesday night’s loss. UP NEXT: The Runnin’ Rebels host Air Force on Saturday afternoon at 3 p.m. at the Thomas & Mack Center. The game will be televised by ROOT Sports. NOTABLE: Sophomore guard Jalen Poyser scored 11 points to lead UNLV in scoring with Ofoegbu, Jones and point guard Jovan Mooring chipping in 10 each. … Mooring played just 18 minutes due to foul trouble and had four turnovers and just one assist. He picked up two fouls in the first 74 seconds after halftime to get to four fouls, then picked up his fifth on a reach-in on a Kell drive to the basket with 6:21 left. So what did Menzies say to him afterward? “You let us down. You let us down because you weren’t disciplined enough to play smarter basketball and not foul. We needed you on the floor son. Just tell him the truth. You let us down tonight, and you can’t do it again. You’ve got to be more disciplined than that.” … Rebel forward Troy Baxter Jr. didn’t play because of a groin injury that Menzies said “flared up” during shootaround. … San Diego State improved to 246-4 in the last 250 games when leading with five minutes remaining. … The 51 points were UNLV’s second lowest scoring output of the season behind only its 94-45 loss to Duke on Dec. 10 at the T-Mobile Arena. … UNLV guard Kris Clyburn and forward Tyrell Green both went scoreless and were a combined 0-of-7 from the floor.